Automatically count printed labels - Label counters from Labelmate do exactly what their name promises: they count the labels on a roll. It is a simple, yet proven method for always having an overview during label production. Depending on the need you choose between devices which count labels once they come out of the printer, and device-independent models. Both variants also count labels on separate rolls, divide large rolls into multiple smaller ones, change the direction in which the labels face and even convert rolls to other core sizes. 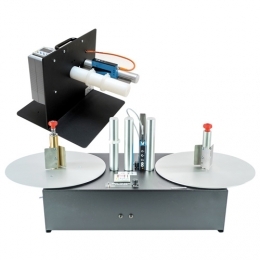 The maximum roll diameter which Labelmate counters handle is 330 mm. The devices are equipped with a sensor which recognizes gaps between individual labels, an easy yet reliable way to achieve exact results. Optionally available are ultrasound sensors for transparent or very dark labels. Simple set-up and a long life cycle are further qualities with which the Labelmate counters convince from the very first to the last minute. Labelmate RRC-330-ACH - Labelmate RRC-330-ACH, label counter, core holder: 25 mm to 101 mm, max. roll diameter: 330 mm, roll width: 152 mm, speed: 72 to 235 cm/sec. Labelmate RRC-330-U-ACH - Labelmate RRC-330-U-ACH, label counter, core holder: 25 mm to 101 mm, max. roll diameter: 330 mm, roll width: 152 mm, speed: 72 to 235 cm/sec. Labelmate RRC-330-U-STANDARD - Labelmate RRC-330-U-STANDARD, label counter, core holder: 76 mm, max. roll diameter: 330 mm, roll width: 152 mm, speed: 72 to 235 cm/sec.